When I decided to buy a flat, I visited "The Heritage" on the launch day after seeing the advertisement in newspaper. I liked the friendly environment very much so booked a flat on the same day for an unbelievable price with all promised amenities. Amarprakash team gave us transparent details about maintenance work, bank loan process, customization etc and made the home buying process easier. When compared to other builder's project in Chrompet, Amarprakash homes are available at reasonable cost with on-time delivery. All my friends liked the security service of the project starting from security desk to access card system. In addition, I thank Amarprakash for providing Kent RO water purifier and other amenities as promised. With my reference, many of my friends and relatives have also bought quality homes from Amarprakash projects. Thank you once again Amarprakash & whole Team!!! The service provided by Amarprakash (Heritage Apartment) was very professional and thorough. Right from the outset, the regular communication through mailers was very comprehensive. The knowledge of your team about the property rates, knowledge base of the real estate companies, their track record and future trends is exemplary. Your complete support for completion of the paper works, but especially for making me feel looked after is well appreciated. It is the integrity; professionalism and experience of companies such as yours that helps ensure a better service for many people. K.Venkatakrishnan Flat No : C-201, the heritage apartment. We found our First home (The Heritage) when it was only 7 months away from being complete. We were concerned with building a home Few miles away as we are not frequent visitor, But Mythili and their team was very easy to work with. She continually kept us informed of progress and decision points with regular phone calls, emails and pictures.The Team was readily available to provide guidance and informed timely responses to any questions.They impressed my family with their "people friendly" attitude. Amarprakash commitment to using quality trades and ensuring that the trades delivered on time and rectifying any issues was present throughout the building of our home. The level of service provided, especially after handover was much appreciated. In my experience, the relationship between a builder and owner works best when there is clear communication between the parties and an equal proportion of give and take. Amarprakash delivered on both counts, and are a builder I would recommend and certainly consider building with again. Building a new home is supposed to be a fun, enjoyable experience, and Amarprakash Builder certainly made that a reality. Their attention to detail is key. We are finally feeling settled into our new home. We can’t thank you Guys enough for your dedication to making our dream home come true. “I own a Flat in “The Heritage” and I am one of the delighted customers of Amar Prakash. I am thoroughly impressed with their professional approach and the way they operate. A special note is required for their communication system which is outstanding. I strongly recommend “Amar Prakash” to my friends and colleagues. This letter is to convey my appreciation for the completion of the project’ The Heritage’ as per the schedule given to me. Thank you very much for your help in building our dream home! Please pass on our thanks and kind regards to all involved. Their good work is much appreciated. We have dreamed of building our dream home. We looked at other builders homes and even obtained quotes but we kept coming back to Amarprakash Developers. They impressed us with their "people friendly" attitude. Our house was finished on time and to our complete satisfaction. All of the staff at Amarprakash Developers were pleasant to work with. If you are looking for quality, great customer service and 100% satisfaction let Amarprakash be your builder of choice. We know that there are a lot of builders out there and that there is a lot of competition. If you are looking for a builder who listens, provides valuable advice, project manages well, keeps you involved and in control, and whose team does a professional job to a high standard, then we suggest and highly recommend Amarprakash Developers to anyone thinking of building or buying a new home. M/S. AMARPRAKASH has given a very good opportunity to buy a dream house in "The Heritage" at Chrompet. They have done what they said. Their Punctuality, Quality, Customer Service and Transperancy are Perfect. Now the area is like a " MINI CHENNAI". After a few years the place will become a beautiful paradise. They have used the State- of- art technology in their construction with great care in quality and price within there proposed time Schedule. We are very much happy since they have given us a good gift for this deepavali. I am Angayarkanni, working for a multinational software company. I have booked a flat in Heritage Project of Amarprakash. The client/customer care process that the Amarprakash asscociation is following is absolutely great. They provide so much respect and flexibility to the customer and has always ensured that customer is satisfied at the end of the day. They were very much approachable by the clients and has always heard whatever feedback we gave to them and has always tried to address them in a positive way. Sincere Thanks for the great service being provided and hearty wishes from my family to Amarprakash to grow longer and establish themselves to a greater extent. Here is my testimonial on Amarprakash and attached docs with this email are our photos. CONVEY OUR NEAR & DEAR TO DEAL WITH AMARPRAKASH. M.Kumaresh iNautix Technologies, Tech Lead. Amar prakash is a very good builder as they have impeccable record of project delivery and is known for timely delivery, quality of construction. I like these guys for their unique style. I can defiantly vouch for them. Me and my family are so happy to tell that we got our flat right on time. Thanks to amarprakash for the completion of the building as proposed. I would like to share my experience of buying a flat with M/S. 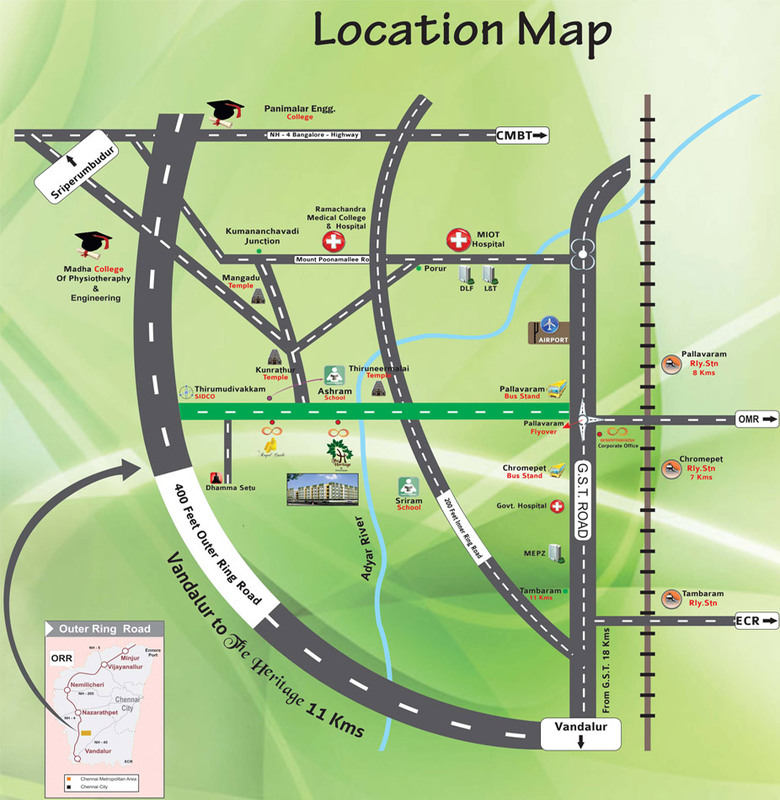 Amarprakash Developers, Chennai. I have booked a 2 BHK flat with M/S Amarprakash Developers in their project 'THE HERITAGE" in Thiruneermalai, Thirumudivakkam panchayat at a distance of 5-6 Kms. from the GST Road at Chromepet, Chennai during their Launch. Their Services are exemplary to their customers sticking to the correct schedule as per the agreement, frequent updates on construction to the e.mails of their customers with real photographs taken at site. They serve to the exact wishes of their customers, with correct instructions for payment, stamped receipts for the payment made by the customers, carrying out all the necessary formalities for the registration of the undivided share of the flat owners, modifying the interiors to the best satisfaction of their customers as instructed by them. The company is TRUST WORTHY and serves best for all middle income group families who aspire to own a house in the vicinity of Chennai City suburbs. I Pray the Almighty for the best of their other projects too and Wish them All Success in their endeavor. Words cannot tell how I feel when I have the wonderful people around who have made the last 2 years @ THE HERITAGE project, a memorable one. Being a part of AMARPRAKASH’s customer was more of a privilege than an opportunity. With many emotions galore, I address my testimonial, as my home is constructed properly as expected….. I would like to heartily thank each one of the associates of Amarprakash Developers Ltd., who are more like well -wishers, personally and professionally for providing me the indefatigable support and encouragement in a truly phenomenal way! Here I begin to express my gratitude to all the Managers, CRM Team, LOAN process team and every one who involved in making this “THE HERITAGE” project – a Grand Success. My Special wishes to my SPOC-CRM: Mythili. I wish everyone all the success in your professional and personal lives. We are very happy to be a part of Amarprakash Family. We purchased a flat from The Heritage – a project recently completed by Amarprakash –at Thiruneermalai, near Pallavaram, Chennai. We realized that we made a right decision on investing on this project after seeing the quality of the work and the professionalism that Amarprakash had shown on this project. We received regular updates and enormous support from their staffs throughout the project. We wish the team all the successes for their future projects. Our family had decided to Book a Two bed Room Apartment with M/s.Amarpraksh through News paper add I must say the entire Experience right from the Booking Stage till Now was a wonderful experience Appreciate the Location in which is been planned, We had chosen’ “THE HERITAGE” at the Thirumudiwakkam , Chromepet , Chennai. I felt they are very genuine and Time bound which is Amazing in today’s World. We are happy to be a part of the Heritage project. The first day when we visited Amarprakash, we never dreamed a house in a span of 3 months. They made are dream come True. Now, my office colleagues are more intrested in the new upcoming projects of Amarprakash, only because of thier commitments, dedication and price. "After evaluating several construction compnaies, finally i have found Amarprash with my dream house. In the first meeting itself, Amarprakash has provided accurate details about project and flat details. I must say this is grate detils with right price have got my flat"
We are now pleased about our option of investing in the Project- The Heritage, Chennai, promoted by you,...We are watching the appreciation of our property value increased within the short time..Good choice. We are the first ones to come book the flat as we aware of your track record. You very well kept your reputation from the planning to execution of works...all went as per the time schedule. We never noticed any vitiation in the measurements or the specifications mentioned in the contract. The quality and the brand name specified in brochure is visible in the construction,, no" BRAND" change in the materials and fittings committed.. Keep it up. The timely counselling & assistance provided by you during the loan process was laudable and we were free as we have to run pillar to post to get the loans..Being I am placed at Sulatanate of Oman, the staff of Amarprakash updated every event and made me free from worries. Now the project is complete and our apartment A-108 is waiting for the Grahapravesam... We are thankful for giving us excellent vastu based, well lit ventilated apartment..
We want the same support to be continued..till the forthcoming association takes over the management of the apartment complex. We are sure that the trend of commitment, clarity, timeliness, quality and courtesy of Amarpraksh builders will contuinue..